We are very selective on what networks we participate in. Below is a by-invitation-only hand-picked travel bloggers network where we also belong, made by people who really enjoy traveling and write about it. There are just 60+ travel writers, bloggers and photographers. TBIN members (us included) have an impressive 6.5+ million social media followers and with their collective exponential influence more than 25 million reach per week. When it comes to Twitter alone, TBIN’s influence is 30+ million potential impacts, and 3+ million potential reach per week. 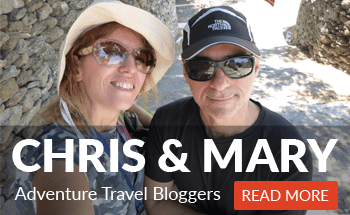 AGreekAdventure Adventure travel (you are in our blog right now) niche audience ranges from 50.000 to 80.000 monthly users (depending on the month) and rises every single month. Contact us to find out how this can benefit your brand. Backroad Planet Howard and Jerry enjoy scouting off-the-beaten path destinations around the world and engaging with their social media audience of 100K+. Their many brand partnerships have led them on roadtrips with Visit Florida and Ford, campaigns with Megabus and Auto Europe, and continued sailings with Viking Cruises. Learning Escapes Marta is an Italian expat based in Ireland, with a combined social media audience of 45K+, and she has a passion for cultural travel, coffee, and family holidays. Her family travel blog aims to inspire families to travel with kids of all ages in a culturally significant and meaningful way. The Go Fever Catherine, a part-time traveler looking to maximize her vacation days, thrives on extraordinary experiences in exotic destinations all around the globe. She looks to inspire others to do the same through destination guides, storytelling and photo journals, which she shares with her combined social media audience of 7K+.